This is the third post on my Hexapod Project series. The point of this project is to build a robot that allows me to try out a few robotics concepts. For a listing of each post in this series, click here. 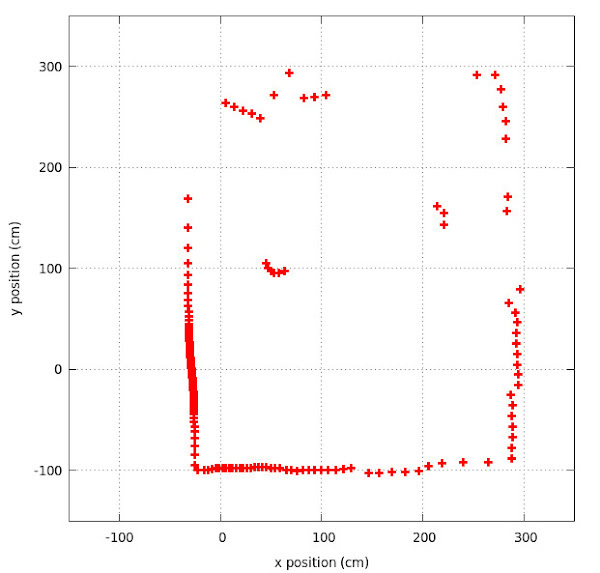 In this post, I'll talk about using laser ranging to let the hexapod keep track of where it is relative to its environment. It's not hard to find examples of robots failing to perform tasks that a human might deem trivial. Even the entrants to the DARPA Robotic Challenge--while amazingly sophisticated in their design--sometimes fail to turn handles, walk through doors, or even just stand upright for very long. If you are unfamiliar with the subtle challenges of robotics, these failures might make you wonder why it takes so much money and time to create such a flawed system. If a computer can calculate the N-millionth digit of pi in a few milliseconds, why can't it handle walking in a straight line? The general answer to this is that the fundamental differences between the human mind and a computer cpu (neurons vs transistors, programming vs evolution, etc) create vast differences in the intrinsic difficulty of many tasks. One such task is spatial awareness and localization. Humans are capable of integrating various senses (sight, touch, balance) into a concept of movement and location relative to an environment. To make my hexapod robot capable of autonomous navigation, it also needs to have a sense of location so that it can decide where it needs to go and where it should avoid going. Arguably the most common way of letting a robot know where it is in the world is GPS. Satellites in orbit around the earth broadcast their position and the current time, and a GPS receiver receives these broadcasts and triangulates its position. 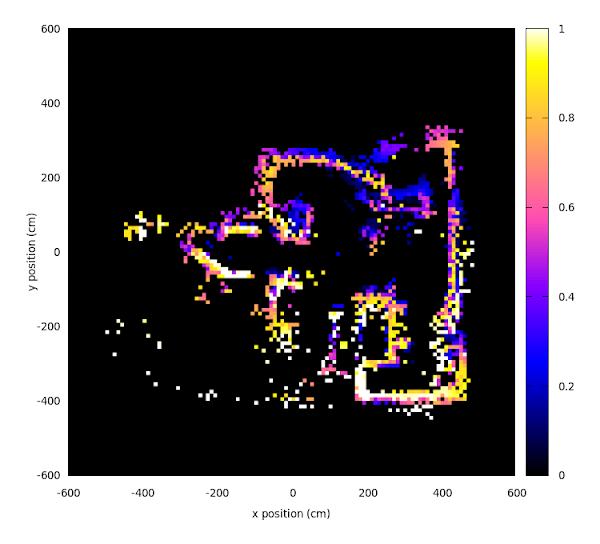 A GPS-enabled robot can figure out its location on Earth to within a few feet or better (depending on how much money you spend on a receiver). The biggest issue with GPS is that a robot using GPS needs a clear view of the sky so that it can receive the signals being beamed down from the GPS satellites. GPS also doesn't give you any information about your surroundings, so it's impossible to navigate around obstacles. For the hexapod, I wanted to avoid using GPS altogether. I chose to use a LIDAR unit for indoor localization, mostly because it seemed like an interesting challenge. LIDAR uses visible light pulses to measure the distance to objects just like RADAR uses radio waves bouncing off objects. A LIDAR unit contains a laser emitter/detector pair that can be swept across a scene to make measurements at different angles. At each angle, the unit emits a pulse of laser light and looks for a reflected pulse with the detector. The delay between emission and detection (and the speed of light) gives the distance to the reflecting object at that angle. High-quality LIDAR units (like those used in self-driving vehicles) can quickly give an accurate 3D scan of the surrounding environment. 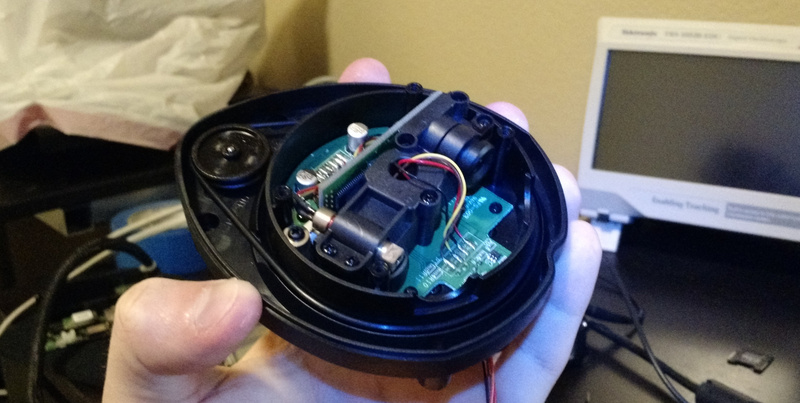 The LIDAR unit I picked is taken from the XV-11 robotic vacuum cleaner from Neato Robotics. You can find just the LIDAR unit by itself as a replacement item on various sites; I got mine off eBay for around $80. The XV-11 LIDAR unit has a bit of a following in the hacking community, as it offers 360-degree laser ranging at 5 Hz for much cheaper than anyone else. While the unit isn't open source, there are some nice resources online that provide enough documentation to get started. It only scans in a 2D plane, but what you lose in dimensionality you gain in monetary savings. Laser module in the lower left, sensor and optics on the upper right. It's hard not to trust any device that sends a smiley face as an opening line. The introduction message isn't too informative, but the fact that it is sent as plain ASCII is comforting. The unit doesn't send any laser ranging data until it is spinning at close to 5 Hz, and the processor has no way of controlling the spin motor. By applying an average of around 3 V to the motor (I did PWM from a 12 V line), the unit spins up and raw data starts flooding down the line. The resources link above provides documentation for how the data packets are formatted, but the key points are that they contain some number of laser ranging measurements, error codes, and the current spin rate of the unit. This measured spin rate can be fed into a feedback loop for the motor controller so that it stays spinning at a nice constant 5 Hz. 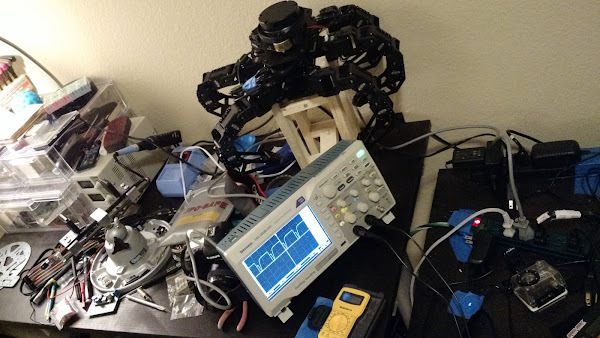 I decided to have the Arduino Due on the hexapod handle communication with the LIDAR unit and keeping the motor spinning at the correct rate. The Due already handles communication between the main cpu and the Arbotix-M, so what's one more device? 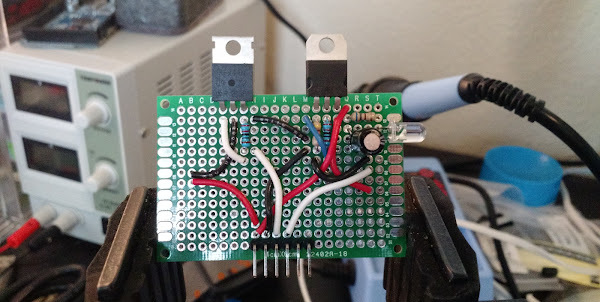 I soldered up a simple board that included an N-channel MOSFET for PWM control of the motor, and a LM317 voltage regulator to provide the LIDAR processor with around 3.3 V.
Motor connects on the left, LIDAR controller on the right. Bottom connects to Due. 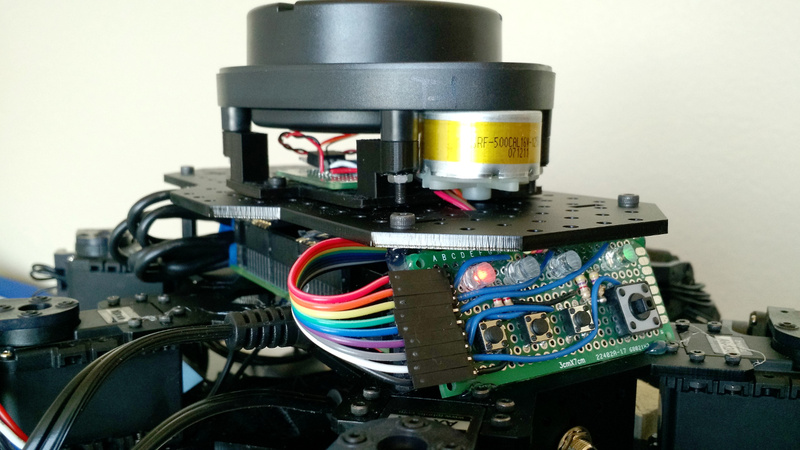 The hexapod kit came with a mounting board for adding accessory hardware, but the mounting holes on the LIDAR didn't match up. I 3D-printed a little bracket to both attach the unit to the hexapod body and provide a little space for the board I had just made. Credit to my Single Pixel Camera project for making me buy a better printer. Attached to the top mounting panel of the hexapod. With the small interface board mounted below the LIDAR unit, I connected everything up to the Due. A PWM line from the Due is used to control the speed of the motor, and the Serial2 port is used to receive data from the LIDAR processor. The 12 V needed to power the motor and processor come from whatever source already powers the main UDOO board. In testing, this was either an AC adapter or a 3-cell lipo battery. I have no idea what I'm testing, but damn does it look technical. Rounded object at (50,100) is my head. Each point is a single laser ranging measurement, and they span the full 360-degrees around the unit. A map like this can be made five times a second, allowing for a pretty good update rate. At this point, the hexapod has the ability to continually scan its surroundings with lasers and accurately determine its distance from obstacles in any direction. But we still haven't solved the problem of letting the hexapod know where it is. By looking at the plot above, we can clearly see that it was sitting near the corner of a rectangular room. If we moved the robot a few feet in any direction and looked at the new map, we would be able to see that the robot had moved, and by comparing the two plots in detail we could even measure how far it moved. As humans, we are able to do this by matching similarities between the before and after plots and spotting the differences. This is one of those tasks that is relatively easy for a human to do and very tricky for a computer to do. Using only the LIDAR scans, we want the hexapod to be able to track its movement within its environment. By matching new scans to previous ones, we can both infer movement relative to the measured obstacles and integrate new information about obstacles measured from the new location. The process of doing so is called Simultaneous Localization and Mapping (SLAM). There are many ways of solving this problem using measurements like the LIDAR scans I have access to. Some methods involve big point clouds, some involve grids. Some are 3D, some are 2D. One of the most common traits of any SLAM algorithm that I've found is that it is complicated enough to scare away amateur robotics enthusiasts. So in keeping to my goal of writing most (if not all) of the software for my hexapod, I set out to write my own algorithm. My algorithm is not great, but it kind of works. I decided to do a 2D grid-based SLAM algorithm because a) my LIDAR scans are only in 2D, and b) point clouds are hard to work with. As the name suggests, a SLAM algorithm involves solving two problems simultaneously: localization and mapping. My algorithm keeps a map of the surroundings in memory, and given a new LIDAR scan performs two steps: matching the new scan to the existing map and infering where the scan was measured from; and then adding the new scan to the map to update it with any changes. As the Wikipedia article on the subject suggests, we have a bit of a chicken-and-egg problem, in that you can't localize without an existing map and you can't map without knowing the location. To solve this problem, I let the hexapod know its initial coordinates and let it collect a few scans while standing still to create an initial map. Then, it is allowed to step through the full SLAM algorithm with a map already set up. My 350 by 400 cm workroom. My head is still at (50,100). Here, we project each LIDAR measurement ($x_i'$,$y_i'$) on to the SLAM map, adjusting for the current best guess of ($x$,$y$,$\theta$). At each projected point, we sum up the distance from that point to every occupied pixel of the SLAM map. This gives us an estimate for how 'far away' the projected scan is from matching the existing map. The three extra terms on the $\Psi$ equation are to bias the solution towards guess values for ($x$,$y$,$\theta$). In this way, we are finding the location of the hexapod so that the new LIDAR scan looks most like the existing map. The assumption being made here is that the new scan is similar enough to the existing map that is can be matched with some confidence. Solving the above equation is a problem of non-linear optimization, similar to the inverse kinematics solved in the previous post. The code to solve this problem is a little dense, so I won't try to explain all of the details here. The relevant code is here, and the relevant method is slam::step(...);. In words, we compute the $\Psi$ equation above and how it changes if we modify each of the parameters ($x$,$y$,$\theta$) by a small amount. Using this information, we can nudge each parameter by an amount that should get us to a lower value of $\Psi$. Since the problem is non-linear, we aren't guaranteed that this gets us to the lowest possible value, or even a lower one than before. To help make sure we end up in the right place, we initialize the solver with a guess position based on how the hexapod legs have moved recently. Since we went through so much trouble in the previous post to plan how the feet move, we might as well use that knowledge to help the localization solver. From there we iterate the nudging step over and over again with a smaller nudge until we find there is no way of nudging it to a lower value of $\Psi$. This is when we stop and say we have found the optimal values of ($x$,$y$,$\theta$). With that, the localization step is done! For computational efficiency, I keep three versions of the SLAM map other than the normal one shown above. The first extra one is the original map convolved with a distance kernel, which at any position gives us an approximate distance to occupied pixels. The next two are the gradient of this distance map, one for the x-component and one for the y-component. These maps allow us to quickly evaluate both the $\Psi$ function and its derivatives with respect to ($x$,$y$,$\theta$). 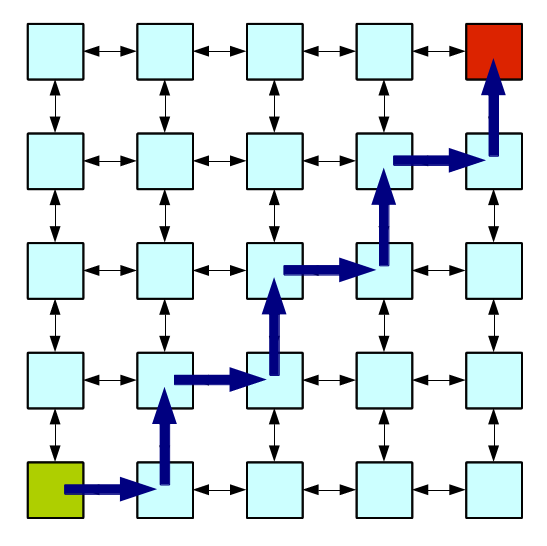 The distance map is computed in Fourier space using the convolution theorem, using threaded FFTW for computational speed. This method doesn't actually give us the correct distance measure for $\Psi$, but it's close enough for this basic algorithm. The companion to localization is mapping. Once we have a solution to where the new scan was measured from, we need to add it to the existing SLAM map. While we have assumed the new scan is close enough to the existing map to be matched, it will have small differences due to the new measurement location that need to be incorporated so that the following scan is still similar enough to the map. In my SLAM code, the method that does the mapping step is slam::integrate(...);. 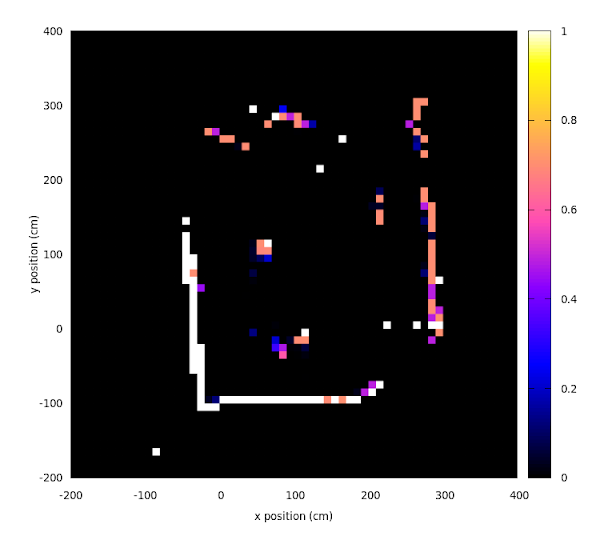 Each new laser ranging measurement from the new scan is projected on to the SLAM map given the estimated hexapod location from the localization step. 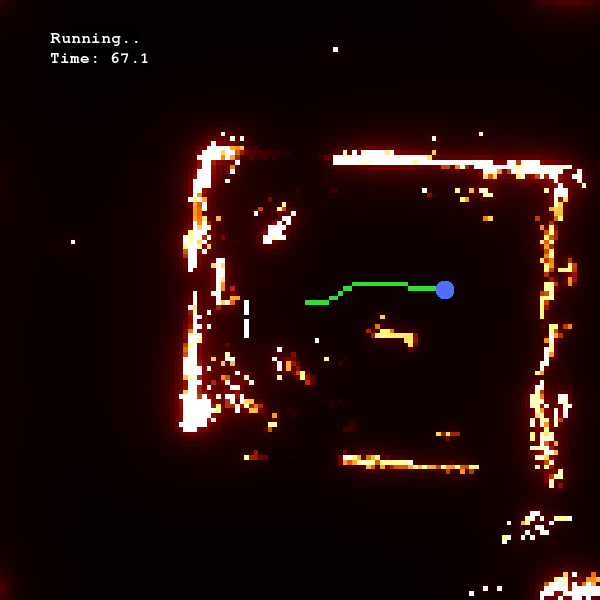 The pixel below each point is set to 1.0, meaning we are fully confident that there is some object there. We then scan through every other pixel in the map and determine whether it is closer or farther away from the hexapod than the new scan measurements. If it is closer, we decrease the map value because the new scan measured something behind it, meaning it must be free of obstacles. If the pixel is farther, we leave it alone because we don't have any new information there; the new scan was blocked by something in front of it. Once this mapping step is done, we have completed the two-part SLAM algorithm and are ready for another LIDAR scan. It's not the best or most accurate method, but it is easy to understand and can run on fairly low-level hardware in real-time. I've written the algorithm to run asynchronously from the main hexapod code, so new scans can be submitted and the hexapod can still walk around while the SLAM algorithm figures out where it is. On the UDOO's Cortex-A9, I can step a 1024x1024 map in around 2-3 seconds. With a 10 cm resolution, this gives over 100 meters of mapping. In practice, I've found that 10 cm is about the coarsest you can go in an indoor environment, but anything less than 3 cm is a waste of computing time. I've also tested this algorithm out in real life with the hexapod. 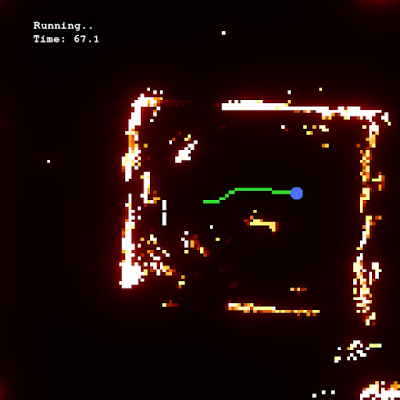 The following SLAM maps were collected by driving the hexapod around my apartment with a remote control. I started the hexapod out in one room, and it was able to walk into a different room and keep track of its position. The maps are pretty messy, but acceptable considering the simplicity of the algorithm being used. Noisy map of my apartment. 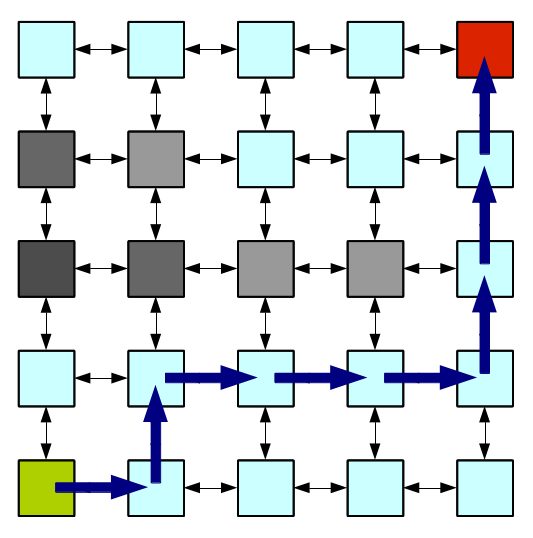 It's not the best SLAM algorithm in the world, but it's relatively easy to understand and compute in an embedded setting. It seems to do best when the hexapod is inside a closed room and can see at least two of the walls. It has some issues keeping track of position when transitioning between rooms, mostly due to the sharp changes in the LIDAR scans when passing through a doorway. Still, it does a reasonable job at keeping track of the hexapod location within my apartment. In the next post, I'll sort out how to get the hexapod to navigate autonomously. With the algorithms presented so far in this hexapod series, it becomes a straightforward procedure of using the SLAM maps to find optimal paths to pre-determined waypoints. This is the second post on my Hexapod Project series. The point of this project is to build a robot that allows me to try out a few robotics concepts. For a listing of each post in this series, click here. In this post, I'll go over the steps (!) needed to get a hexapod robot walking. At this point, I have a robot with six legs, three servos per leg, and the electronics and code to control each servo independently. 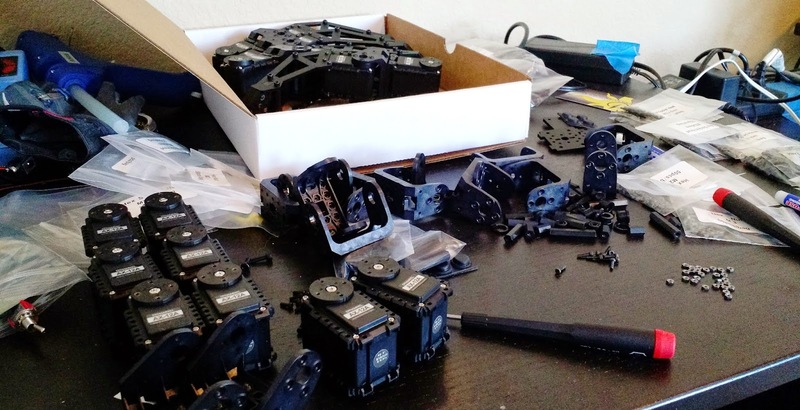 But with no guidance for how to move the servos, the hexapod is useless. With their above-average leg count and sixfold symmetry, hexapods can move around in all kinds of unique ways. 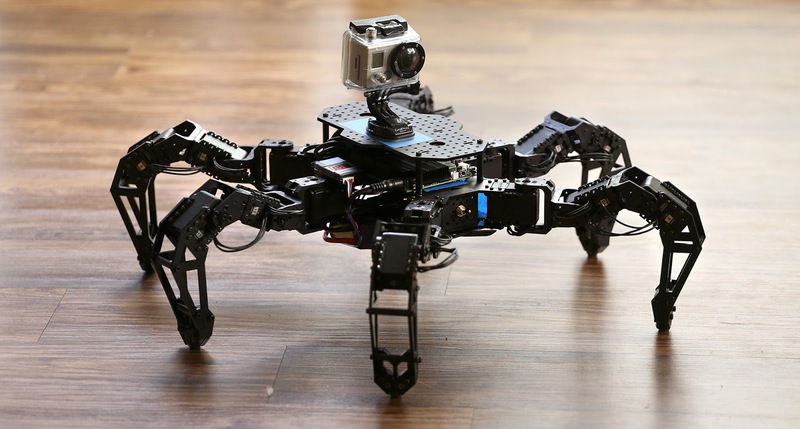 While dancing around is certainly a possibility for my hexapod, I'm really only interested in getting it to walk around. So to begin the process of getting it mobile, let's start with the basics of getting a robot to walk. Here, $\theta_c$, $\theta_f$, and $\theta_t$ are the servo angles for the coxa, femur, and tibia joints, respectively, and $l_c$, $l_f$, and $l_t$ are the distances between the joints. The position and angle at which the leg is connected to the body are represented by $x_0$, $y_0$, $z_0$, and $\theta_0$. This set of equations represent the forward kinematics of the leg. Each leg has an identical set of equations, but with different values for the initial position and angle. These equations can tell us where the foot is, given the angles of the servos, but we need to do the opposite. Unfortunately, there isn't any way to rearrange the equations above so that we can plug in the foot position and solve for the servo angles (go ahead and try!). Fortunately, this doesn't mean that it's an impossible task! The process of inverting these equations is called inverse kinematics, and I've done a project on it before. My other post explains how to go about solving an inverse kinematics problem, so if you're interested in the details, check that out. In short, the inverse kinematic solver takes a target foot position and outputs the servo angles that it thinks are appropriate. Starting with the servo angles as they are, the algorithm uses the forward kinematic equations to see which way each servo needs to turn so that the foot ends up slightly closer to the target. It takes many small steps like this until the forward kinematics equations say the new set of servo angles put the foot in the right place. This kind of procedure has its flaws, though. Imagine you tell it to find the servo angles that put the foot a mile away? The algorithm has no way to achieve this since the legs aren't nearly that long. In situations like this, it often goes haywire, giving you a nonsensical result for the servo angles. So careful attention to the iteration procedure is important. Impressing Alan the cat with robot weightlifting. The six legs are broken up into two groups which trade off being the support for the body. The legs within each group lower to the ground in unison, move towards the back of the body, then lift up and move back to the front. The two groups do this exactly out of phase with each other so that there are always exactly three feet on the ground at any one point. For my hexapod, I've modified this a bit so that the three legs within each group hit the ground at slightly different times. I've done this to reduce the repetitive jolting that occurs from moving each leg simultaneously. Notice the sharp change in direction at the start and end of when the foot is in contact with the floor. The transition to weight-bearing doesn't happen instantaneously (imagine carpeted floors), so the sudden transition when the foot goes from moving down to moving back creates problems. To create a smoother path for the feet to follow, I turned to Bezier curves. Bézier curves are smooth functions that are completely determined by a sequence of points that I will call anchors. These anchors specify generally what shape the curve has, so tweaking the shape of the curve just involves moving around the anchor points. Going from a set of anchor points to the resulting Bezier curve involves a series of linear interpolations. Given some intended distance along the total path between 0 and 1, we start by linearly interpolating between each adjacent anchor points. So if we want to know where the Bezier curve is halfway along the path, we start by linearly interpolating halfway between each pair of adjacent anchors. If we have $N$ anchors, this gives us $N-1$ interpolated points. We then linearly interpolate again halfway between these $N-1$ points to get $N-2$ doubly-interpolated points. 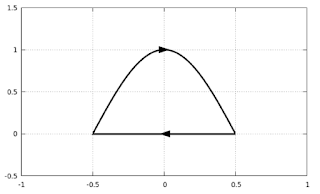 We continue this procedure until we are left with a single interpolated point, and this is the position of the Bezier curve at the halfway point. The procedure for generating Bezier curves is a little difficult to describe, so I've made a little interface to help explain it. Drag the grey anchor points around to see how the Bezier curve changes, then increase the Guide Level slider to see the various levels of linear interpolation. To make sure the hexapod stays steady when walking, I've kept the straight part of the foot path where the foot touches the ground, but set the return path to be a Bezier curve. I wrote a simple Bezier curve class to handle the computations on the hexapod. Applying this Bezier curve stepping method to each leg in an alternating pattern gets the hexapod to walk forwards, but it can't yet handle turning. To implement turning, my first instinct was to simply adjust the amount by which each foot sweeps forward and back on each side of the body differently. This would cause one side to move forward more than the other, and the hexapod would turn. The problem with this method is that it isn't particularly physical. If you try it, you'll find that the hexapod has to drag its feet sideways to compensate for the fact that it is turning sidways but the feet only move forward and back. In order to let the hexapod turn naturally, you need to go into a different frame of reference. If you tell all of the feet to move up towards the sky, the hexapod moves closer to the ground. 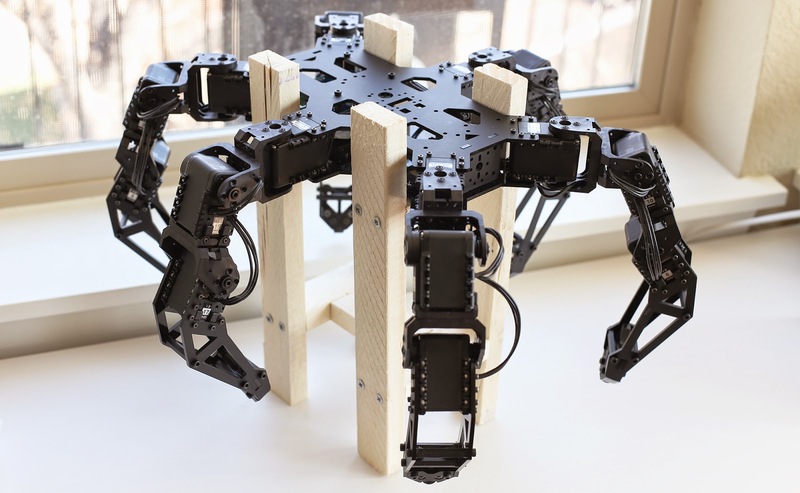 Tell the feet to move down, the hexapod moves up. It can get confusing to figure out how to move the feet to get the body to move a certain way. I've found it's best to think that the hexapod body stays still in space and the ground just moves around relative to it. Then all you need to do is make sure the feet are in contact with that moving floor and they don't slide on it. For straight walking, we can just see it as a treadmill-like floor that continually moves backwards, and the feet are just trying to match the treadmill speed. For turning, we can think about the hexapod sitting above a giant turntable. How close the hexapod body sits to the axis of rotation determines how sharp of a turn it makes, or what the turning radius is. In order to keep the feet from sliding around on the turntable, we need to make sure each foot travels along a curve of constant radius from the axis of rotation. If we set it so the axis of rotation is directly underneath the body, the hexapod will stay in one place and just turn around and around. If the axis of rotation is set very very far away, there will barely be any curvature to the foot-paths, and the hexapod will basically walk forward in a straight line. To help explain this concept, I've made another little interface for seeing how the hexapod feet need to move. Move the bottom slider around to change the turning radius, and enable the helper lines to see how each foot follows a specific path relative to the axis of rotation. To incorporate the Bezier curve method from above into this view of walking, I convert the foot positions into polar coordinates around the axis of rotation and use the Bezier curve to pick the $\theta$ and $z$ coordinates as a function of time. In the hexapod code, I've parameterized the turning by a single parameter that relates to the turning radius. Between the turning parameter and a single speed parameter, I have full control over the movement of the hexapod. At every time step, the code considers the current values for speed and turning, and decides where along the Bezier curve each foot should be. It then computes the actual positions in space from the curves and feeds these positions into the inverse kinematic solver. 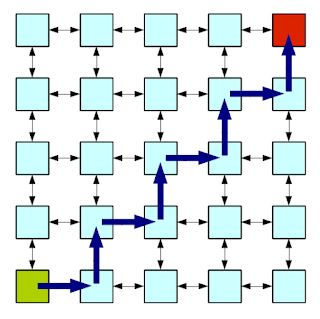 The solver outputs servo angles for each joint of each leg, and the main code packages these up and sends them off to the lower-level processors. This whole procedure is fairly quick to compute, so I can update the servo positions at about 50Hz. At this point, the hexapod can walk around freely, but does not know where to go. In the next post, I'll go into giving the hexapod a sense of awareness through laser ranging.